can invest and manage their funds for themselves: simply and transparently. Its open investment network is a trusted source of personal financial empowerment. With over 1.75 million users in more than 130 countries, and 2,000 new accounts opened each day, it’s the world’s largest investment network. eToro offers a welcoming home for investors’ financial decision making, however experienced they are, and however they like to trade. It supports investors of every shape and size and enables them to pursue the investment strategies of their choice. Through its community powered trading network, eToro offers investors the freedom to trade what, how and when they want to, along with all the help and support they need to thrive as investors. eToro provides financial trading across a wide variety of assets including spot trading in currencies, and contracts for difference (CFD’s) in commodities and indices. Focused on global assets, eToro offers trading in 16 currency pairs, Gold, Silver, Oil and the world’s most heavily traded indices; including the Dow Jones, S&P 500 and FTSE 100. eToro offers a wide range of services to investors, including premium account services for high net worth traders, featuring dedicated personal support and a generous benefits package tailored to the needs of individual clients. Trading terms include generous and flexible leverage provision extending leverage to clients from 1:2 up to a maximum of 1:400. Its Guardian Angel feature, meanwhile, automatically monitors key indicators like risk taking, money management and decision making, and alerts investors when they’re going off track. Weekly trading challenges pay out $10,000’s in prizes to the best performing investors. eToro’s commitment to social trading is what really differentiates it from other investment opportunities. At eToro enables its customers to invest in people as well as in assets by learning from and copying top traders. At eToro’s social investing network, Open Book, every investor can see all the trades made on the entire eToro network as they happen, follow and interact with other traders and copy the trades of the best traders. Investors can also invest their account balance by following a portfolio of individual pro traders through eToro’s Copy Trader feature. Investors who are new to trading can benefit from the markets simply by copying experts. Experienced investors can join eToro’s guru trader program and receive monthly rewards based on the number of traders copying their trades. eToro’s financial services are provided by licensed and regulated brokers. Each of its brokers is subject to rigorous compliance terms which dictate how they handle client funds, secure financial transactions and indemnify clients. RetailFX Ltd is a registered Cypriot Investment Firm (CIF) with the Cypriot Securities & Exchange Commission (CySEC) under license number 109/10. RetailFX operates under the Markets in Financial Instruments Directive (MiFID) and is authorized to operate in 40 European countries. In Asia Pacific, eToro’s brokering services are provided by IC Markets, regulated under ASIC (AFSL 335692) the financial services regulating body in Australia. 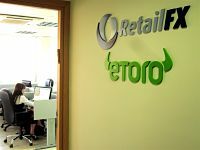 In the USA eToro operates through eToroUSA, an introducing broker to FX Solutions. Both eToroUSA and FX Solutions are regulated by The Commodity Futures Trading Commission (CFTC) and the National Futures Association (NFA).